This is the first time on this blog doing the 12 of 12, but I figure why not? Sure... I'm only 3 and they say I might be less than perfect by why should that keep me doing the 12 of 12? Maybe it will help somebody... you never know until you get yourself out there.. So, as I said I am 3. The name is Benji, I like my full name though because it's Benjamin as in ben-jamin. Cool huh? Anyhow... I was born with a couple heart defects, nothing too major, they repaired the bad one and the other is doing a wait and see. The awesome thing is that right now I am just being observed. No meds, no restrictions really... aside from no football or other things that could involve a strong impact. I also have hypoglycemia, my sugar drops if I go too long without eating or if I get too hot. 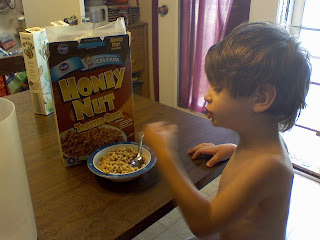 Sometimes it will drop when I am sick too... this can be tricky for mom because some days I just don't want to eat. Getting to the other stuff... 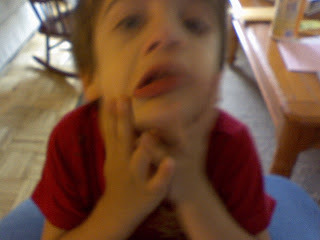 I have developmental delays and the doctors told my mom that I may have a form of autism. 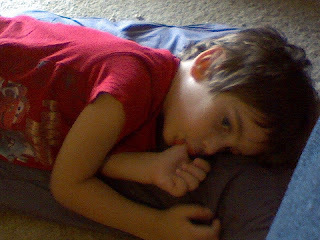 I do have sensory processing disorder and that gives mom alot of fun. I am sensory seeking and sensory defensive. Mom walks a fine line many days. But I love her and she's really good with it. She tries to be understanding when I have my bad moments or days. I think it's hard for her sometimes especially if I get tired at a store. People give her strange looks and tell her that she should spank me sometimes. I don't know how to express my self all the time, and sometimes I get so over stimulated it even catches me off guard. So.. on to the 12... that is.. if you are still with me. You are aren't you? I got up this morning about 7:30. I was missing my sister Brittany at first, then I realized everybody but mom was gone. Then I remembered, they had to go to school... I just wasn't ready to face that this morning. 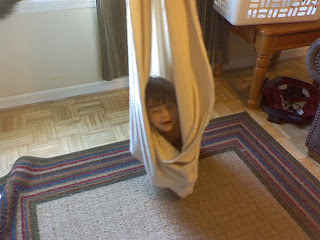 So, I got in my swing (It's really cool, mom made it and it hangs from the ceiling. I am all wrapped up snug and can swing to my heart's content... most of the time at least.) I stayed in the swing until my stomach woke up.. LOL... I suppose that's how most of us are huh? Yeah... little bit on the personal side, but this is a big step for me. I have had a hard time learning to stay clean and dry. 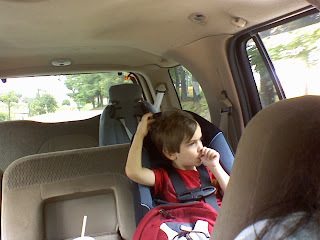 Mom thinks it's because of the sensory issues. Which it is possible because the surgery to fix my heart could have caused some damage to my spinal cord and I may not feel everything I should. Or... as mom says it may just be because I am a boy... not sure how to take that mom. Anyhow.. 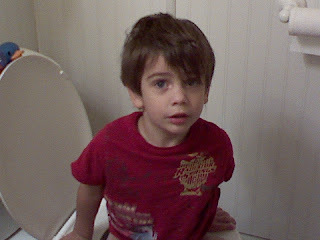 I can most of the time use the potty when I just need to go pee. Go ME! I eat lunch early since I go to school. I only have snack at school since it's only 3 hours. 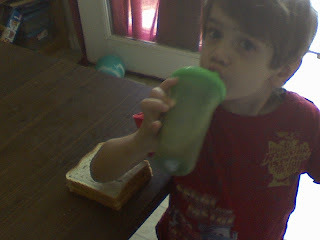 On the menu today was peanut butter and honey on wheat bread with almond milk mixed with Ovaltine. Yummy! 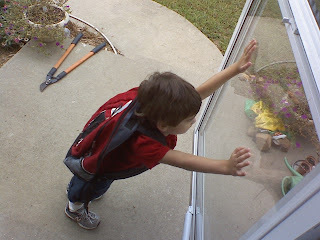 Off to school we go. I'm holding the door open for mom here. I like my school, I have fun there with my friends and today I get to meet some new friends. Isn't it pretty? I love flutter byes... 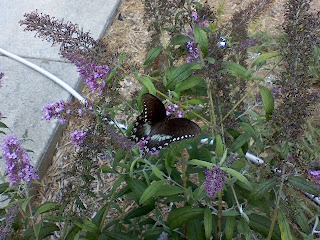 Mom has alot of flowers that the flutter byes visit and dance around. This one said hello to us on the way to the truck. I did all my activities and centers well. I even shared with my friends today. I was just so happy to see them! During the summer we only had a couple play dates with other friends so being back in school is great! And guess what? Because I was good and did everything my teachers asked me to i got a toy! And it's a toy car! I love toy cars! 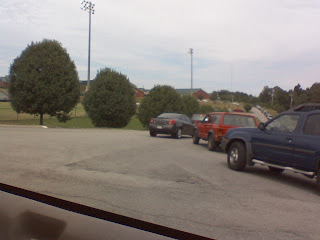 My school is way back in the background... look at all these parents picking up their kids... I didn't know there were that many kids in my school. WOW. I'm not happy. Micah got a transformer toy from his teacher and I didn't get anything. I have a transformer toy but I can't find it and it's not fair. Mom says I got a toy car at school but that was then... this is now... I want a transformer toy. Mom!!! I want it!! I really really want it!!! MOM!!! I went outside and played for about an hour with my brothers... Mom took a picture but the camera ate it so I can't put it here. I love playing in the willow tree though... letting the branches run across me as I run under it. I also like playing in the dog's pool.. LOL... it's one of those turtles that most people fill up with sand. The dog like to cool off in it. 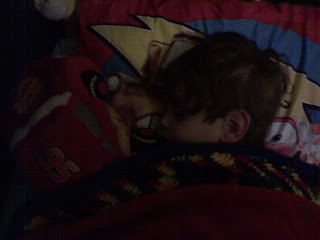 Finally, I fell asleep while watching Noggin in mom and dad's bed. I don't like sleeping because I might miss something. I also don't like to sleep alone. I will probably end up in Mom and Dad's bed or in bed with Britt. I just don't like being alone. Welcome to 12 of 12 Benji! It sounds like you're quite a remarkable boy, and you have an awesome swing. And cool flutterbyes too!